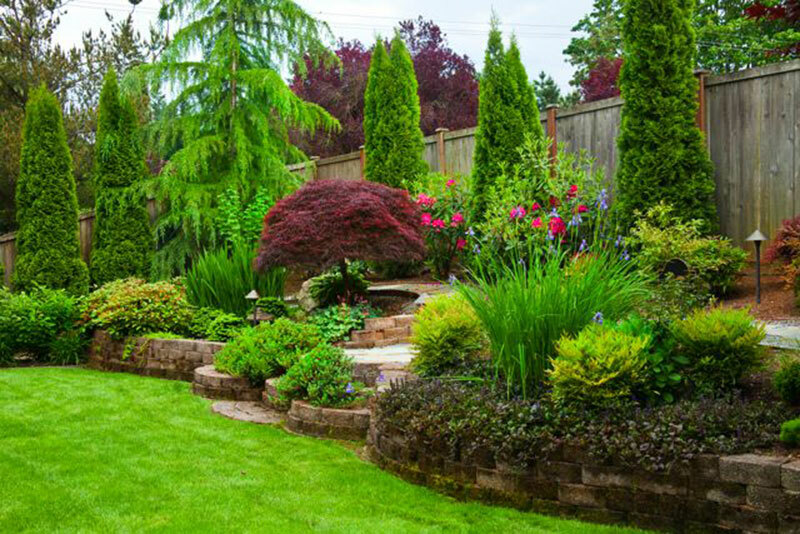 Landscape renovations offer exciting opportunities to create beautiful, useable space out of previously overgrown, unappealing areas. 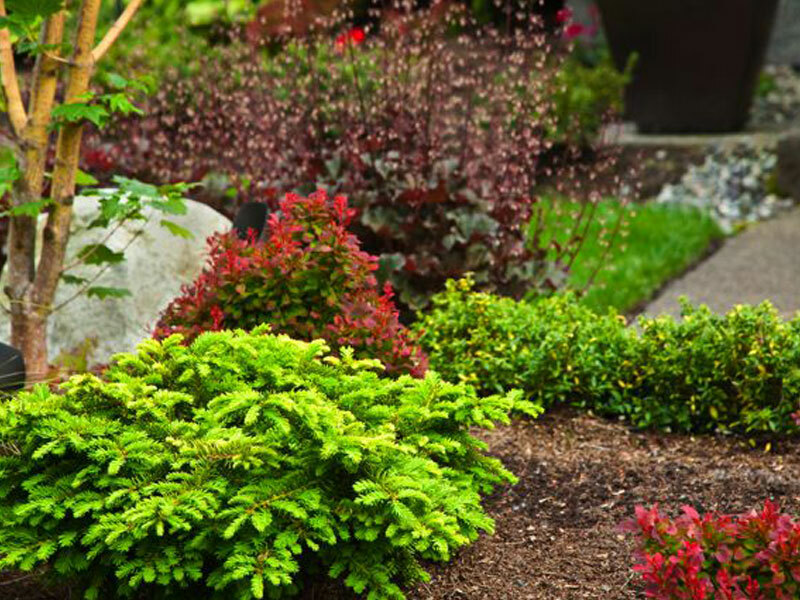 Through a thoughtful mix of evergreen and deciduous plantings, a year round oasis can be created. 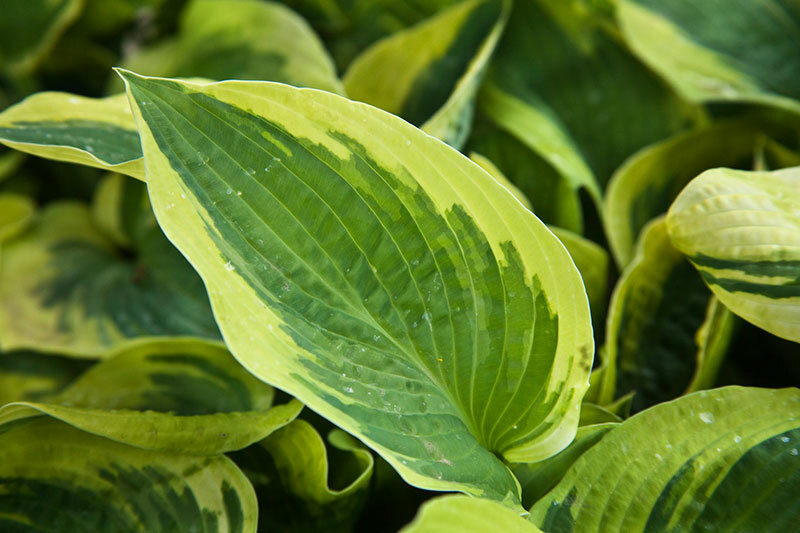 In each landscape design, special attention is directed at maximizing each property’s attributes ie: views, existing plant material, home’s architectural features, etc. 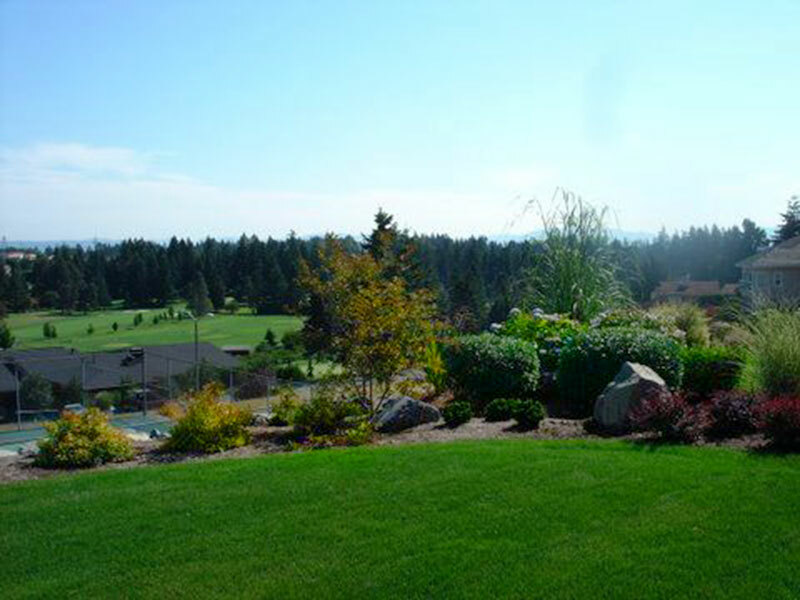 Well thought out plantings (that will never grow too tall) frame and enhance this view of the golf course. 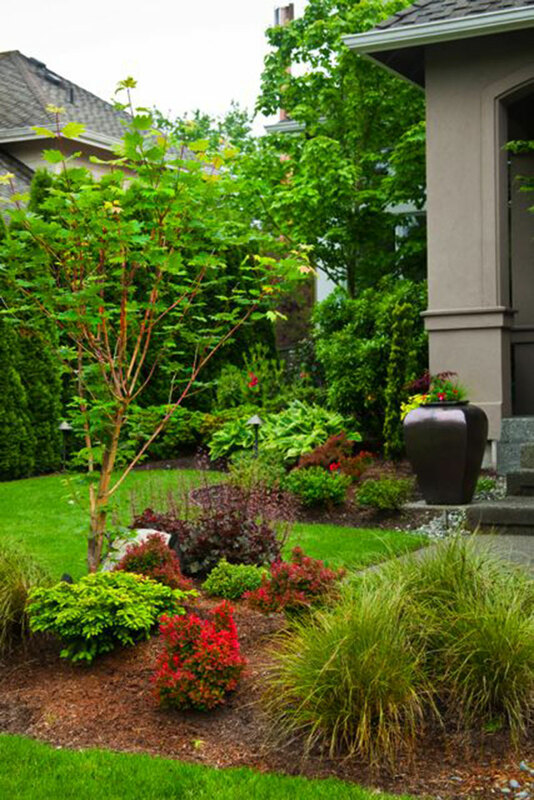 Shrubs and perennials planted in this mature landscape add the layers that give the garden interest. 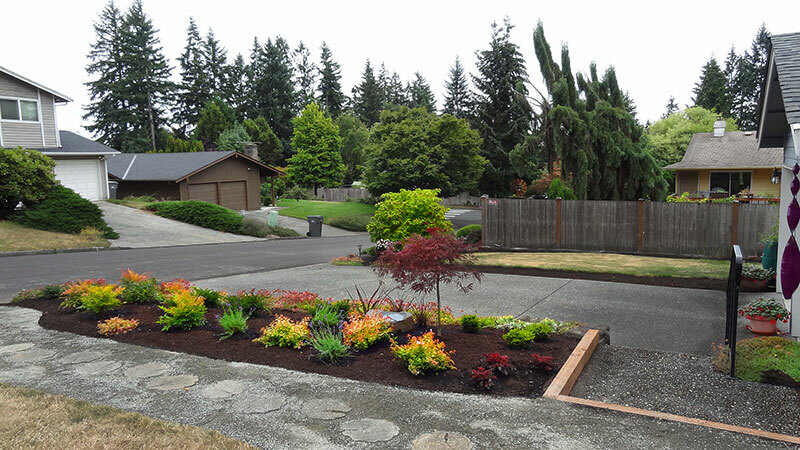 Featured design projects showcase the variety of designs Shannon Grina, Certified Professional Horticulturist and owner of Grina Landscape Design has created. 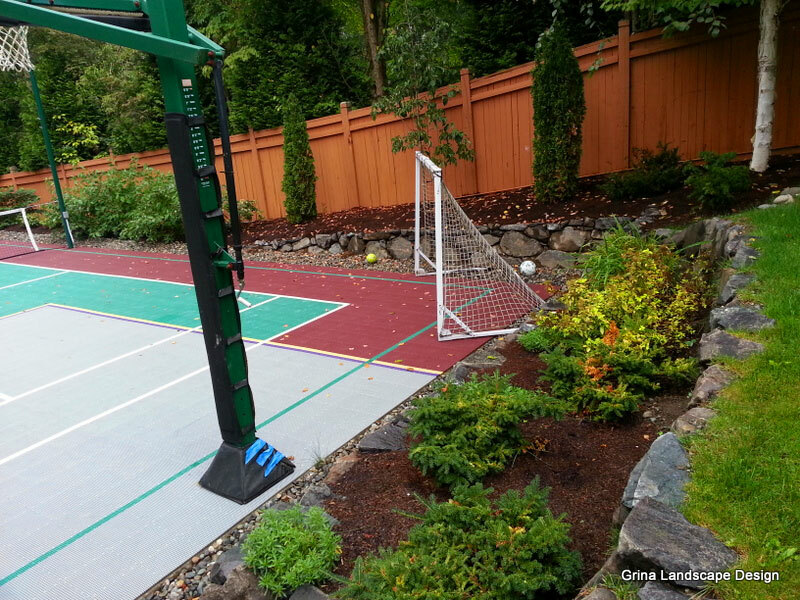 Each addressed the client’s own goals and became yards the homeowner can enjoy for years to come. Often times it is through the landscape’s biggest challenges that uncommon opportunities arise. This client loved color. 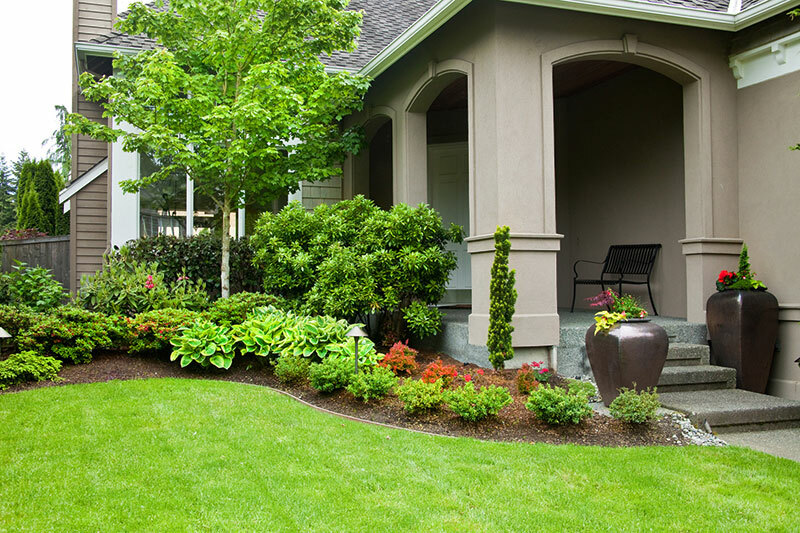 The beautiful containers planted with the same color palate as the new plant material makes the front entrance even more appealing. 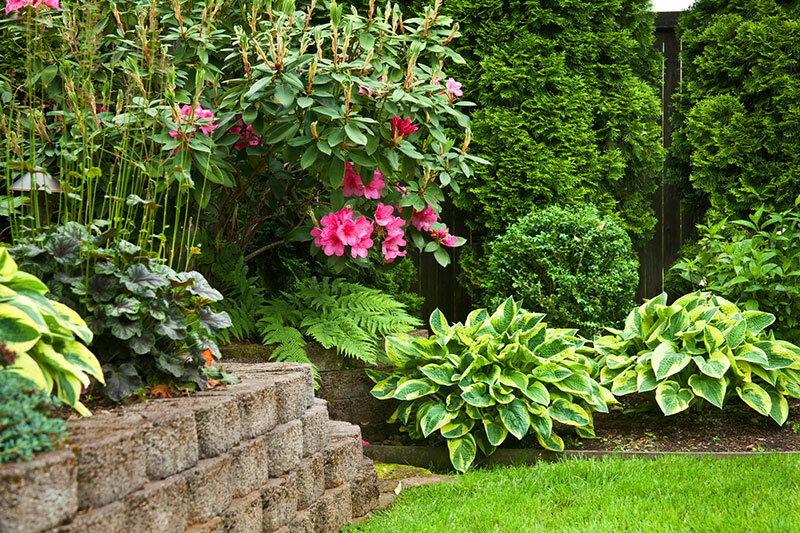 This original block wall loses its prominence when supported by striking plant material. 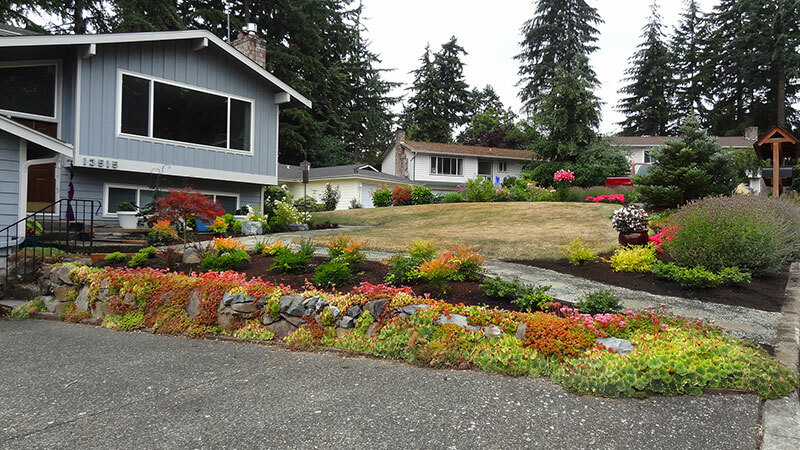 Even rhododendrons and arborvitaes become interesting with bright perennials at their base. 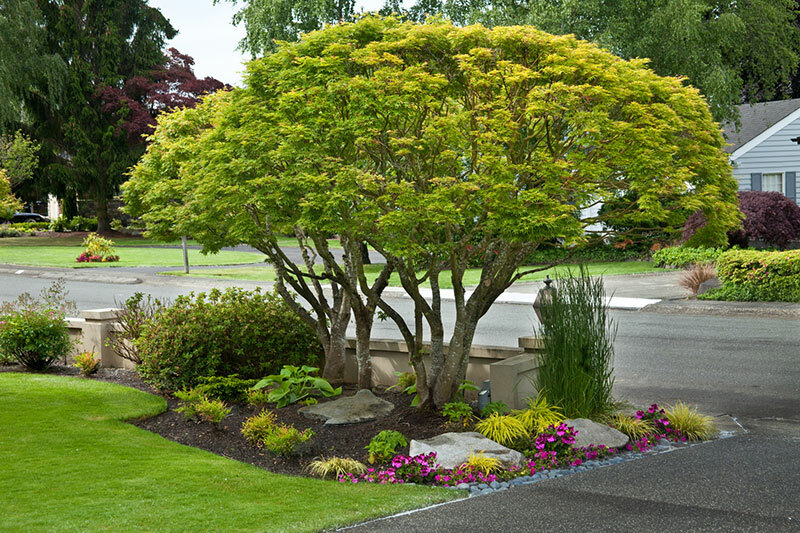 Bright summer splendor highlights these beautiful established maples. 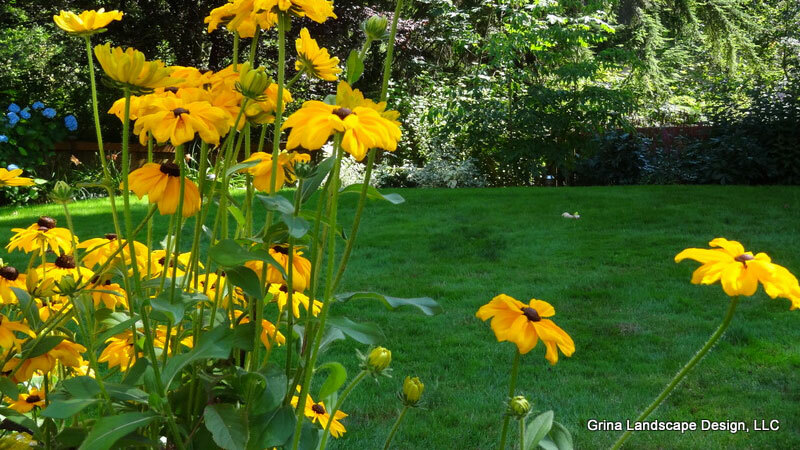 Shrubs and grasses provide the “bones” of the garden that easily accommodate seasonal annuals. 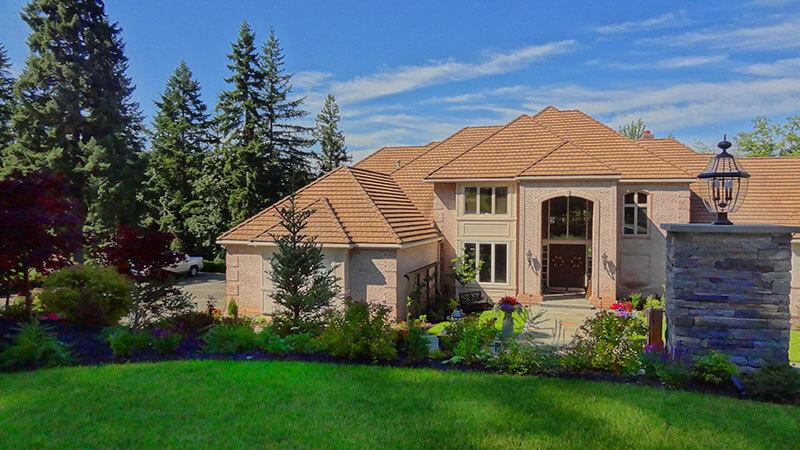 Once blocked by a brick and iron fence as well as huge arborvitaes, this spectacular home is now visible and inviting. 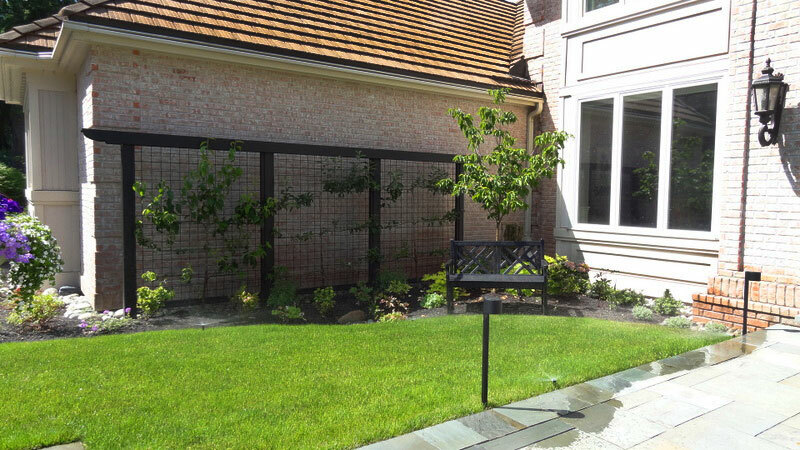 The large brick wall at the front entrance to this home provided a unique opportunity to add interest with the dark trellis that accommodates espaliered fruit trees. 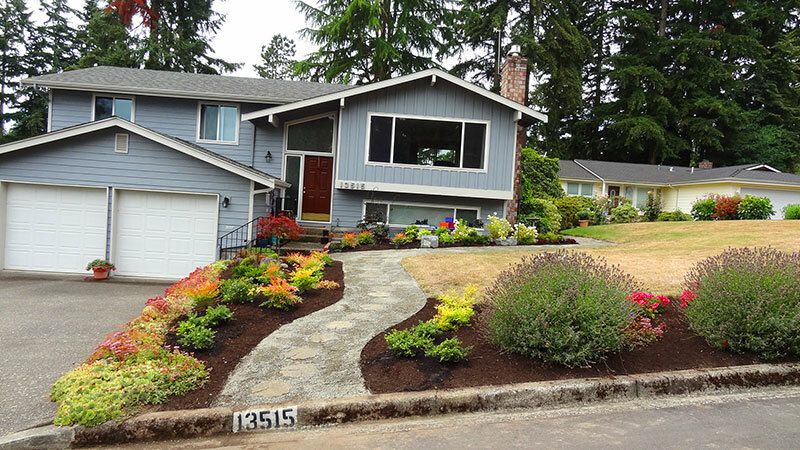 With the help of semi evergreen blueberry shrubs, they transform this front yard into an edible landscape area. 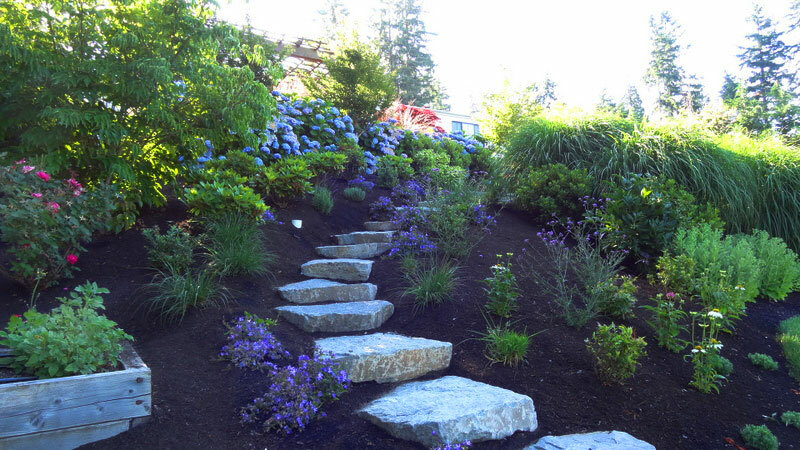 Many of the home’s original plants were relocated and then enhanced by complimentary plantings in the garden bed created by the new stone stairway. 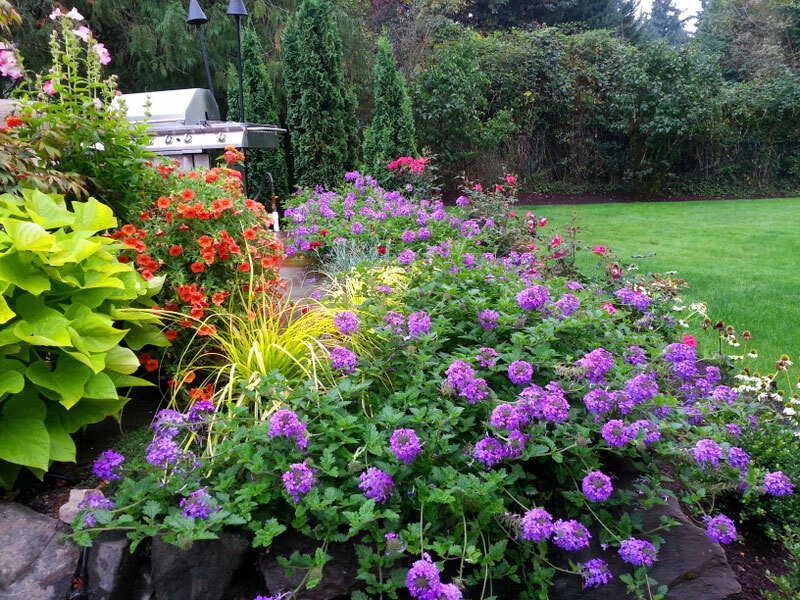 This vibrant planting bed brightens the space and adds a fun element to the patio grilling area. 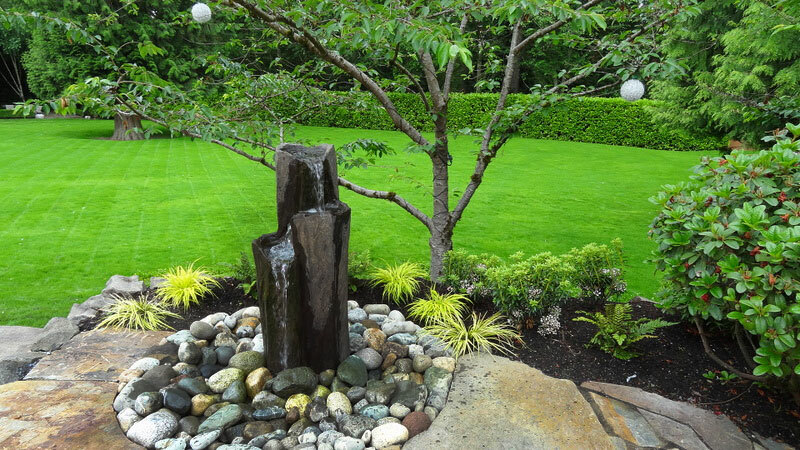 A client selected water feature is the focal point of this backyard view. 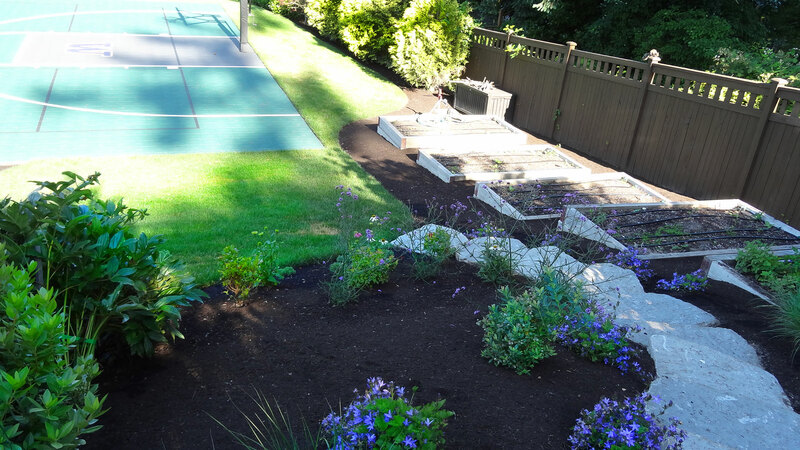 The new plantings make the sports court (previously considered an eyesore) fit nicely into the rest of the landscape. 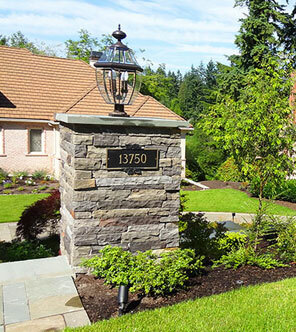 Natural stone steps match the concrete to make the transition down the hill more seamless. 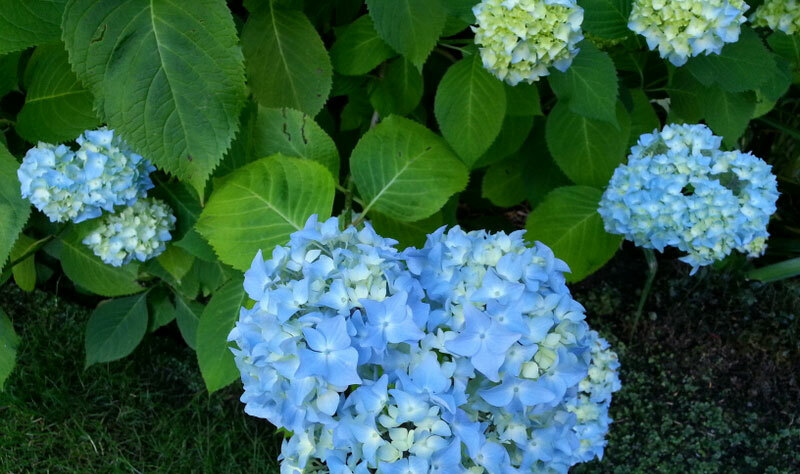 Plantings took their cue from the color of the existing hydrangeas and look as though they have always been there. This existing landing created the perfect location for a pathway through the garden to the raised beds. 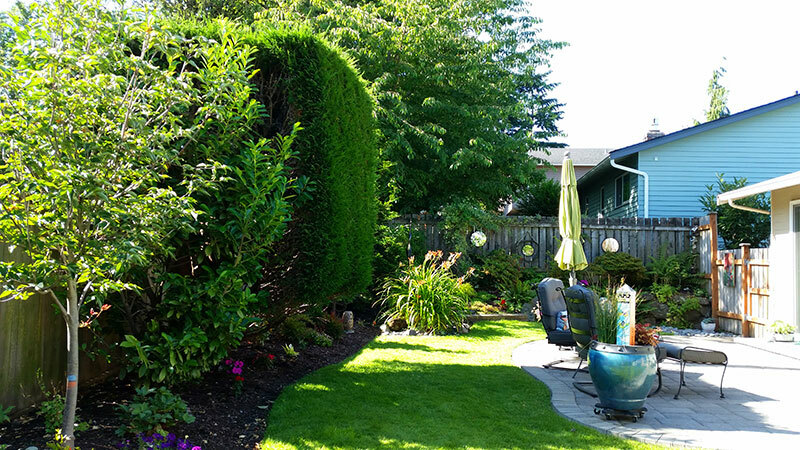 Renovation of this yard removed huge hedges that required constant care. 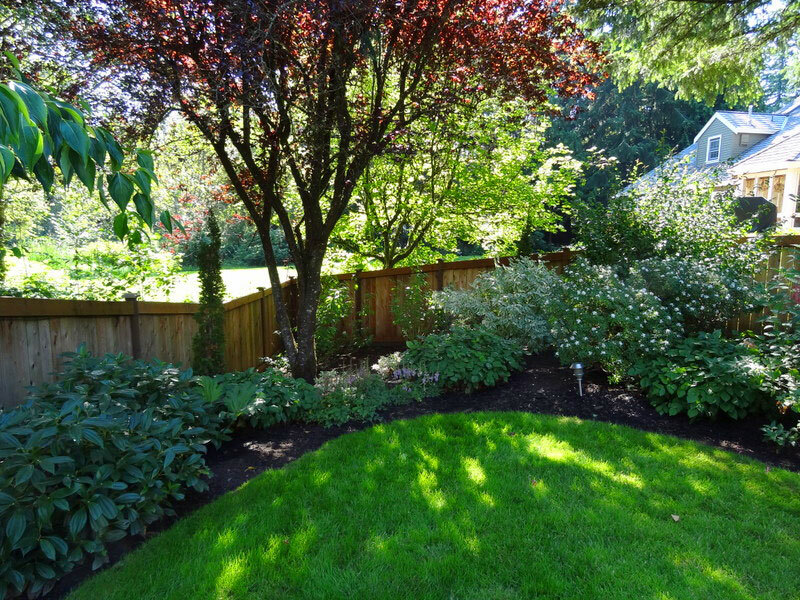 The yard is now bathed in sunlight and color and requires only minimal maintenance. 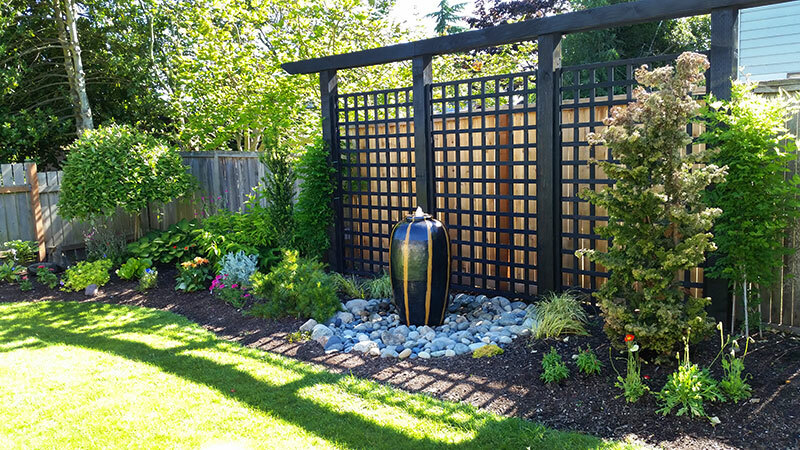 Although the home behind is now exposed, the new lattice and water feature become the view’s primary focus. In design, function is foremost. Previously the only way to the front door was down the driveway and up the uninviting, narrow steps. 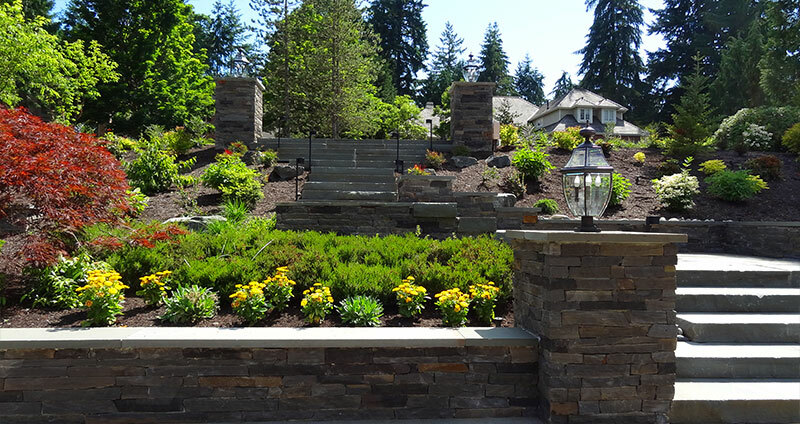 Established rock wall plantings served as the inspiration for the new plantings above. 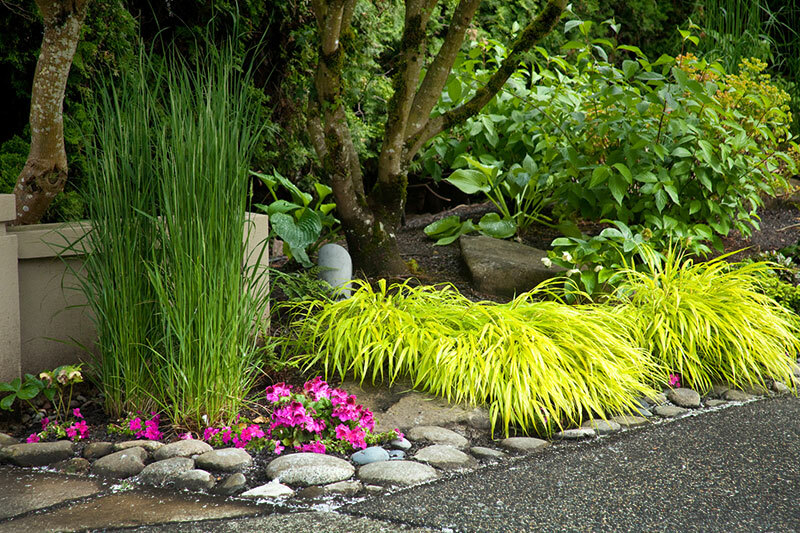 Easy-care plantings and the new pathway now directs visitors to the front door. 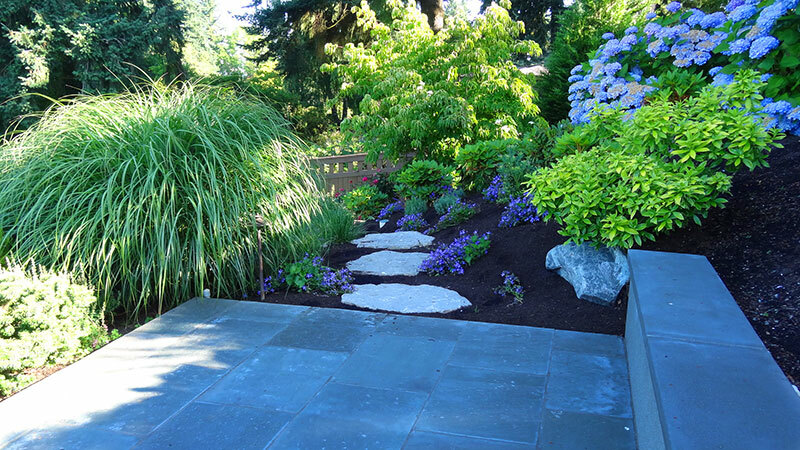 The homeowner’s paver stones add interest to the crushed gravel path.